Note: Further dimensions on request. Product information "Lithoprotect® UV-Protection Yellow Foil"
The Yellow Y520 film is waterproof and resistant to oils, greases, fuels and aliphatic hydrocarbons. The Yellow film is dissolved or swollen by chlorinated hydrocarbons, ketones, aromatic solvents. This may affect the optical properties. 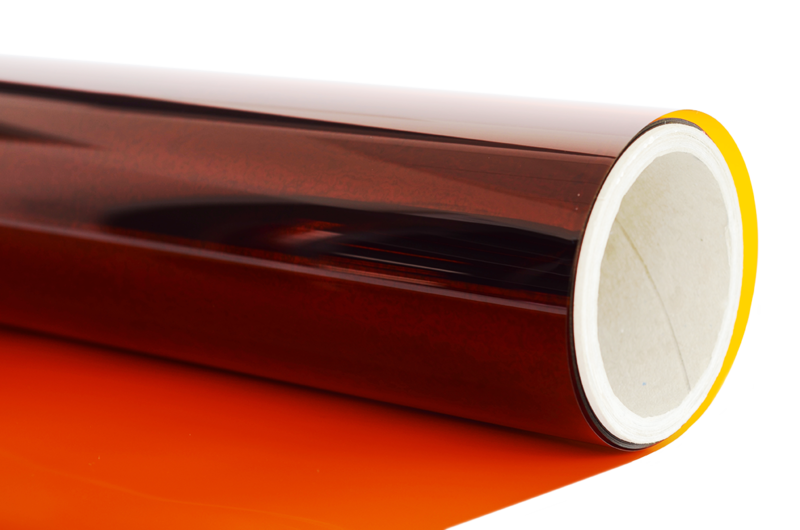 The UV protective film is not resistant to concentrated acids and alkalis. In these compounds, the foil is attacked. The UV-protective film Yellow Y520 is self-extinguishing. Since the UV-protective yellow foil Y520 is made from the natural product of cellulose, it shows a certain water absorption ability that can affect the dimensional accuracy. This water uptake was however reduced to a low level. The Y520 has an average water vapor permeability, which allows a rapid drying of the mounting fluid after foil installation. Under proper storage conditions of 5 - 25 °C and a relative humidity of 30 - 60%, the UV protection film Y520. 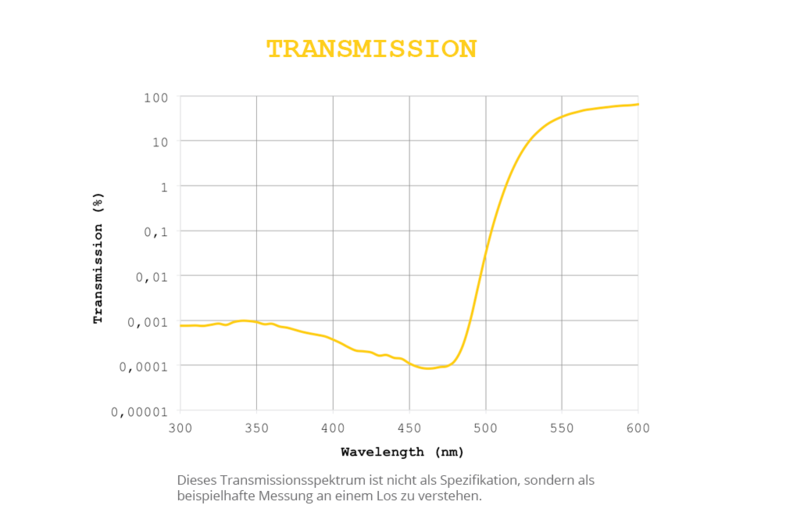 The optical transmission properties of the UV-protection foil Yellow Y520 were specially designed for the high quality standards in the field of yellow rooms (photolithography in microelectronics manufacturing). The graph shown below is semi-logarithmic. At 450 nm wavelength, the transmission is approximately 0.0001%, thus dropped to a fraction of one millionth of the incident light. If you compare our foil with other foils, be sure to ask for a semi-logarithmic plot of the transmission since these differences cannot be seen in a linear plot. The UV-protective foil Y520 can be processed comparable to paper. You can use UV stable double-sided adhesive tape stuck to windows, privacy screens, room dividers, lamps and front openings (available from us). We recommend, however, for large windows applications, to use our self-adhesive UV protection film Yellow YSA520. To filter fluorescent tubes we offer special polycarbonate tubes, in which our UV blocking filter is incorporated (yellow light). Customer evaluation for "Lithoprotect® UV-Protection Yellow Foil"